2:11 I'm done. See you next week. Thnaks for coming. Take 4 courses. 10 to 100 contracts consistantly. 1:44 will my stop hold up? 9:31 I expect a narrow range today as the market consolidates after a big up week. 9:26 Today's trade times are 09:50, 12:42, and 14:08 . I have to leave before the last one to pick up my daughter from the airport. 6/8/2012 1:43:04 PM MT sdg:: Wife says same thing; why not do both. 1.I have a long commute (60 miles 1-way) and 2. I long for the freedom and independence! Going through a cutback in 2005 really opened my eyes. 6/8/2012 1:38:53 PM MT BBB****:: I too would love to do this full time, but for now I just make my mortgage payment each month and am happy with that. I have a great income in my occupation, and love to learn something new every day. Finding Al has made me love sitting down at my desk every day again. 6/8/2012 1:16:19 PM MT sdg:: BBB - Thanks! Did the CFA and CMT as well. Given Al's descriptions, CTME would likely be the place to start...now to find the extra $$! Trying to commit to consistent profitability, enough to work for myself in the not-to-distanct future. 6/8/2012 1:11:06 PM MT BBB****:: Sdg - it was the Berkley Front. I have done the CFA and I have taught technical analysis at the Universtity level as the Professor during my Masters was all Fundamental and my class portfolio killed it, so he asked me to. I can honestly say that nothing even approaches the courses Al has put together. The information is key and I have been perusing Chaos Trading Made Easy all day today. The Fractal of Pi is an essential tool as well - it is astounding to watch things unfold. I do admit that I am not very good at Face of God and, without saying too much, I do just need to work at it. The info in Cash in on Chaos is essential as well. 6/8/2012 1:09:12 PM MT sdg:: will short 21.25 for a scalp if it comes. 6/8/2012 1:06:43 PM MT sdg:: BBB - how subjective do you find the courses? I understand the art/science aspect. Would imagine, given Al's background, mostly objective though some may be open to interpretation. 6/8/2012 1:01:55 PM MT sdg:: I have been a Friday lurker for over 10 years. Will speak to the wife this weekend about the hotline subscription and take it from there. This is stuff not taught in the CFA or CMT programs. 6/8/2012 1:00:20 PM MT BBB****:: I am out at 22. Nice day everyone. sdg - I live in the Heights north of Downtown. Too bad we can't all do a MoonTide happy hour somewhere once a year! 6/8/2012 12:59:25 PM MT sdg:: Quite a few of those, likely in Greektown. Heading to Houston/Spring to visit friends (Godson's birthday) then maybe Padre for a few days. 6/8/2012 12:55:48 PM MT sdg:: Oops, should have guessed Tx based on the previous comments. Heading that way in 3 weeks. 6/8/2012 12:52:07 PM MT sdg:: BBB - you in NYC? I am in metro Detroit. 6/8/2012 12:49:01 PM MT sdg:: Should read bad week. Yesterday mid-day high was 25, may keep a lid on the rest of the day. 6/8/2012 12:47:42 PM MT sdg:: Stop out for a point, was playing it tight...more trades for more days. Bad ticket and traffic ticket this morning messing with my head. 6/8/2012 12:42:35 PM MT Tg****:: Thanks for the clinic Al. The two bargain courses Al mentioned are great but the clinic and many comments in the past clinics are free and loaded with useful info. Too tired to carry on. Good night. 6/8/2012 12:39:59 PM MT BBB****:: so where do we think this one is going - I bot 1321 for third time and hung on through the chop, but think I am just going to go for 5 on this one. 6/8/2012 12:05:53 PM MT BBB****:: Citi was the death of SB. I had been at Morgan Stanley, and moved to SB in 2004 after MS shut down their Texas Muni tradin desk. When MS bought SB in 2008-2009, I had to get out of there again. My business was cut in half when they started trading Texas bonds out of New York. Big firms can be so asinine it is staggering. 6/8/2012 12:01:14 PM MT Tg****:: I was at Smith Barney from 1996-98. I sort of liked it then but they merged with Sol Bros and I left. Probably different culture post merger. Merrill was the pits in my experience, run by overpaid morons right into the ground. I remember them launching a huge multibillion internet fund a few weeks before the March 2000 tech top. 6/8/2012 11:52:41 AM MT sdg:: Still in the biz, managing investments for an RIA. 6/8/2012 11:51:10 AM MT BBB****:: I was at SB from 2004-2009. Hate that place. 6/8/2012 11:43:42 AM MT Tg****:: I was an equity/fundamentals analyst for 15 years. Stops at Smith Barney, Oppenheimer, Merrill Lynch. 6/8/2012 11:39:36 AM MT BBB****:: I have been a muni bond broker for 12 years. I wish I had found Al back in 2000 when I started. Would be a lot better off today if I had. Not to mention I would have sent everyone I know to his site. 6/8/2012 11:35:53 AM MT Tg****:: I think I started lurking on Friday's back during the 2000 to 2002 bear market. 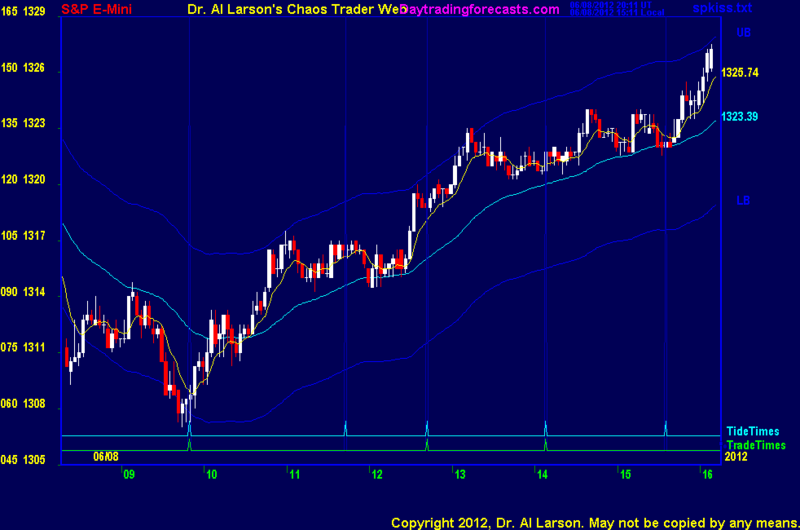 I think I found my way to him via the moneytide.com web pg and his nice Japan stock market call and chart on that site. I probably started subscribing around 2003 or so, I believe. I've switched methodologies a few times. I used to try to take a trade on every moontide timing. Lately I've become a lot more selective. 6/8/2012 11:32:12 AM MT BBB****:: Got out for +5, nice trade Tg. 6/8/2012 11:24:01 AM MT Tg****:: locking 9, have a cover at +12. 6/8/2012 11:20:57 AM MT BBB****:: or methodology - sounds better than "system"
6/8/2012 11:20:39 AM MT BBB****:: Gotcha - how long have you been trading Al's system? 6/8/2012 11:18:26 AM MT Tg****:: Just a temporary work assingment for 2-4 years...not mine, my wife's. I just day trade...I mean night trade. She works for today's bills, I trade for our retirement and the eventual college tuition bills. 6/8/2012 11:09:40 AM MT Tg****:: Yes, still in and still here. But going back to NJ on 6/25 to the end of July. 6/8/2012 11:02:42 AM MT BBB****:: Nice trade so far Tg - I got out for a small gain - you are in Singapore right? 6/8/2012 10:52:49 AM MT Tg****:: still holding initial position from 5.25. 6/8/2012 10:39:15 AM MT BBB****:: took the continuation buy at 17.75 on old contract, 11.75 on the new one. 6/8/2012 10:36:26 AM MT Tg****:: BBB, Yes to your question. But 4 to 5 transition was tricky. Al says it's crazy Harry, conductor of the S&P train. I like baseball analogies. Trading is like standing at home plate against a pitcher with nasty stuff, he's tossing curves and sliders and knucklers. Have to wait for a good pitch to hit. 6/8/2012 10:03:51 AM MT Tg****:: I don't know, I think the more pressing question is, is this really move 1 off of a completed down fractal yesterday, or is this move 4 of that fractal from yesterday's top. I don't clearly see 7 moves from that top, more like a 1-2-3. Haven't put a FOP overlay on it though or looked at the 24 hour picture. 6/8/2012 9:37:02 AM MT BBB****:: Would you all say this is move 5 of 7 setting up from the bottom? 6/8/2012 9:29:51 AM MT Tg****:: Al, do you ever just say, hay I'm in early on what looks like a move 1 after a completed fractal from prior day. Let me just hold to the close. Many times I thought about it and didn't do it only to see there was a +18-20 there. Everytime I actually did it and passed on the 7-9 area I whished I'd taken the sure thing. 6/8/2012 9:11:47 AM MT Tg****:: I was going to say roughly the same thing Al. I am cognizant of the economic and news releases that send those damn hegefund computers into a frenzy though. Like to watch dust settle first after those sorts of releases, other than that I don't pay attention to much else. But...In the old days of the real bull market I'd swear that the market flew up every time Greenspan gave a speach and started yapping about how productive we all are. Of course any excuse to rally back then. 6/8/2012 8:59:42 AM MT BBB****:: Funny story - I was on the phone with a corporate bond trader who always buys puts on SPY right before Obama speaks. I told him I was going long the ES and he said I was nuts. The bet was a steak dinner - and I am going to be hungry. 6/8/2012 8:52:40 AM MT Tg****:: really nice 20/110 seperation wit smooth curvey exmas and bottom right on the tidetime. Straight from the moontide tutorial. That's what we want to see. Bought 5.25 in anticipation based on the 20/55 cross and good initial tiling. Now has to crack the 440. 6/8/2012 8:00:29 AM MT Tg****:: I was doing well re: money but personally I just can't put in orders then forget about them. So always looking and hardly sleeping isn't a good lifestyle. Sometimes there are good setups in the 8:15 to 9:29 period on the rainbow chart and I'll take one of those. 6/8/2012 7:50:22 AM MT Tg****:: sdg, last Summer and Autumn, when there were large overnight moves taking place on decent volume the 24 hour moontides worked very well. After volatility started to drop it wasn't worthwhile. However, I can often see late in the day moves that look incomplete and usually will finish the next with a gap open. The problem is, on low volume some of those moves can and often do retrace 120% overnight and still turn out to complete the next day as projected. 6/8/2012 7:44:10 AM MT Tg****:: FYI Al, the charts are still on the June contract...rollover was yesterday. 6/8/2012 7:28:13 AM MT sdg:: Anyone trade outside of normal NY market hours? 6/8/2012 6:40:20 AM MT sdg:: Happy Friday!